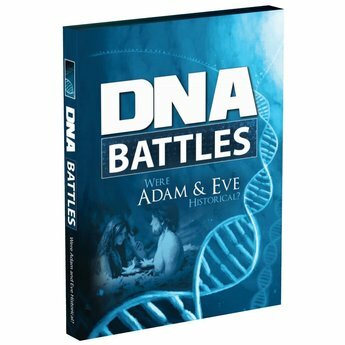 Home / Media / DVDs / DNA Battles: Were Adam & Eve Historical? Is the history revealed to us in the Scriptures true? Were Adam & Eve real people? Were they the first two people or was there a population of hominids that just appeared on scene together at the same time? The June, 2011 cover article in Christianity Today lays out several positions for the historicity of Adam and Eve. 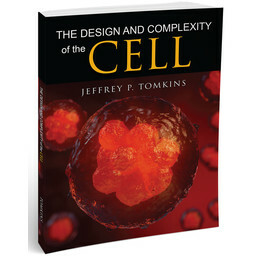 Francis Collins, director of the National Institutes of Health, started the BioLogos Foundation. BioLogos is leading the charge for the position that Adam and Eve, if they existed at all, were part of a collective of some 10,000 hominids. The article states, “A BioLogos paper by Venema and Falk declares it more flatly: the human population, they say, 'was definitely never as small as two... Our species diverged as a population. The data are absolutely clear on that.'" But are the data as clear as they state? What has recent research revealed about mitochondrial DNA? Does recent research on nuclear DNA support evolutionary predictions? 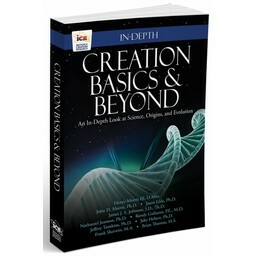 In this new DVD, hear what seven scientists and two theologians have to say about the evidence. 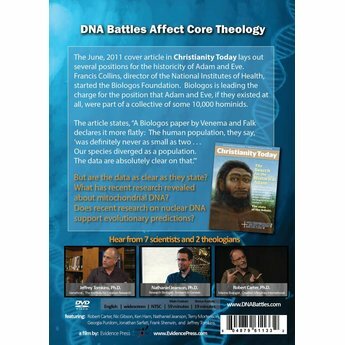 Title: DNA Battles: Were Adam & Eve Historical?